ZARINA, Lasma and AGAFONOVA, Viktorija (2017) 4D library – mindfulness and presence. Paper presented at: IFLA WLIC 2017 – Wrocław, Poland – Libraries. Solidarity. Society. in Session 112 - Poster Sessions. It has been a long time since library was only a place to get a book from. Nowadays library is a place where you are not only using sight and hearing, but also other senses. 4D library is based on emotions - helping to find the right feeling for every individual. 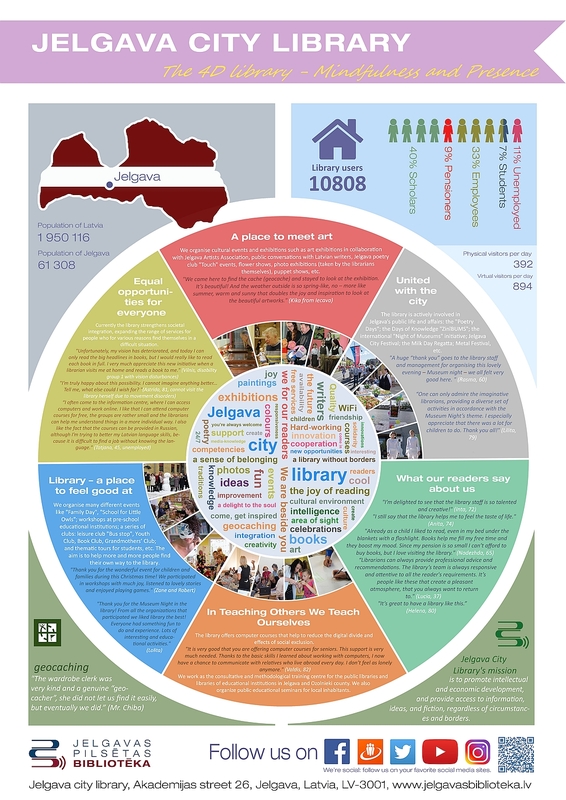 Jelgava City Library (JCL) works hard to make our 10 808 readers feel welcome - youth, adults, children, singles and families, that is why JCL has a tradition to organize "Family days" four times a year. During these days people of all ages are involved in a wide range of activities. JCL also organizes "Poetry days" every year. The event takes place in the city centre and it creates a special atmosphere in Jelgava for locals and guests. It is not only fun and interesting for participants, but engaging and heart-warming for the audience as well. These events not only bring our readers closer to the library, but also serve as an excellent team building activity for our librarians that take part in most of the activities the city is organizing. 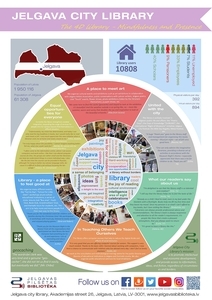 Allowing readers themselves to engage with and feel the library in all its diversity, Jelgava City Library is able to turn a simple visit to the library into an adventure. Jelgava City Library - a place of good feelings!